Hello beauties!! Scrubs are a must inclusion in one's bath and body routine in order to maintain a healthy, soft and glowing skin. Scrubs are helpful in removing sun tan too other than removing dead skin cells. 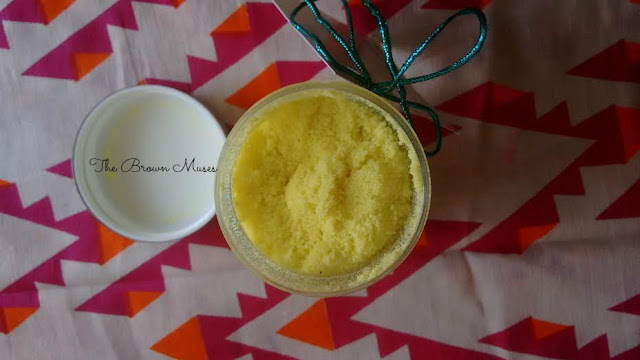 Today I will reviewing a scrub which I purchased from the house of Amara Organix. The scrub goes by the name of Rice Enzyme And Sandalwood Salt Scrub. Let's see how the product fared for me. Packaging: The scrub comes in a plastic jar with a silver coloured screw top which shuts tight hence making it travel friendly. The full ingredients list and other details like price, shelf life and date of mfg are missing from the labels and I have been told the brand is working on it! 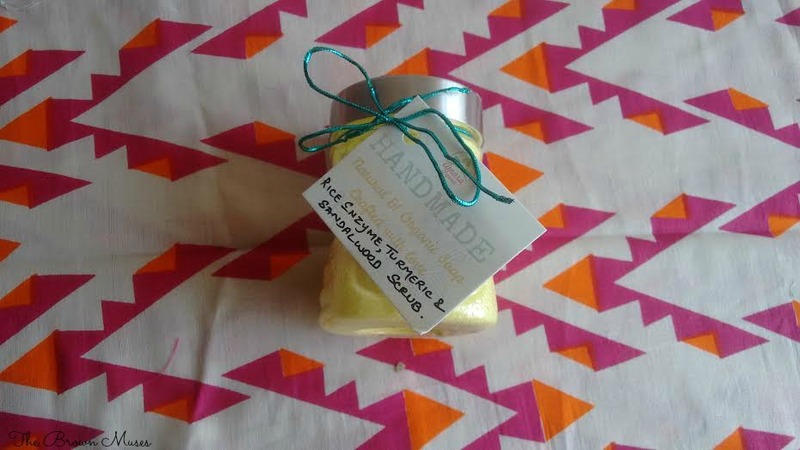 AO Rice Enzyme And Sandalwood Salt Scrub is yellow in colour due to the presence of turmeric and has a dry and gritty consistency due to the presence of pink Himalayan salt in it. The scrub has a strong smell and upon taking a close whiff one can smell sandalwood. I take a spoonful of scrub using a clean and dry spatula as the product is preservative free and contains only natural ingredients and using a wet spatula/fingers could contaminate the product. A spoonful of scrub is enough for entire body. 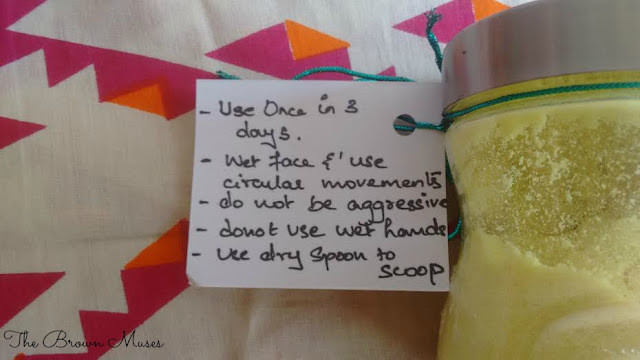 I take the scrub in small quantities and scrub it on damp skin using extremely gentle strokes. If scrubbed hard it could chafe the skin as it contains sea salts and they are a bit on the abrasive side. After scrubbing, I leave the scrub on my skin for 2 minutes and then rinse off. The scrub removes dead skin cells effectively and gives a nice glow to the skin. The instructions say the scrub can be used on the face however I have never used it on my face yet. Since the scrub contains pink Himalayan salt it pushes all toxins out of the body, the skin becomes soft and healthy. It has been seen that regular pink Himalayan salt baths can enhance the skin tone to a large extent. Massaging also improves blood circulation and relaxes tired muscles. Other ingredients like rice enzyme, sandalwood, lemon and turmeric act as natural bleaching agent which help in removing sun tan. I've not noticed drastic changes but it does remove sun tan if used 1-2 times a week. Overall, AO Rice Enzyme And Sandalwood Salt Scrub is a scrub that helps in removing dead skin cells and cleaning out pores without dehydrating the skin. Will I recommend: Of course!! Removes dead skin cells and cleans out the pores. Smells good but it may be a bit strong for people with sensitive noses. Very reasonably priced for a handmade product. Will last long if used wisely. Gives a nice glow and reduces sun tan to an extent if used consistently. Doesn't stain the skin despite turmeric being one of the ingredient. Availability - Not for me. Might be a little abrasive for sensitive skinned beauties. Wish the brand would provide a spatula to scoop out the product.